Robert Sabuda is one of the foremost pop-up creators of the present day. His work is featured regularly in special collections and museum displays of pop-up book artistry. Here are two new, gift quality, out-of-print pop-up titles with paper insects in paper frames, still in the publisher's plastic case. 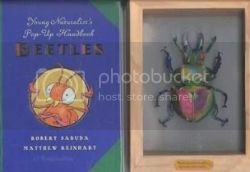 These are the first two pop-up books in the "Young Naturalist's" series. 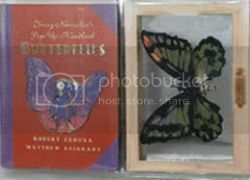 Six pop-ups in each book, with a paper insect in a paper frame for each book inside the publisher's plastic case. Published by Hyperion in 2001. Each 14 p.; 11.7 inches. Click here to purchase one or both titles. Postage is not included and covers the cost of shipping, handling and insurance. We offer new, used, hard-to-find and collectible books, sheet music, and ephemera. Contact us at the email address below for any questions. Books are shipped within three days of receipt of payment.